It might be cold and dark outside, but enjoy the promise of sunshine to come with my spring flower display. This design is to be found in the latest issue of Cross Stitch Collection – out today.The small stitched sections will give you an idea of the colour shading; the blend of different yellows makes the petals glow with warmth. 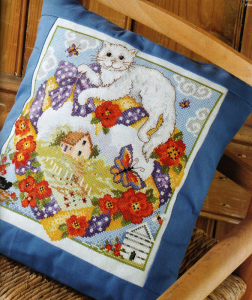 This small design - one of mine - is to be found in a chart booklet that accompanies the latest Cross Stitcher magazine. 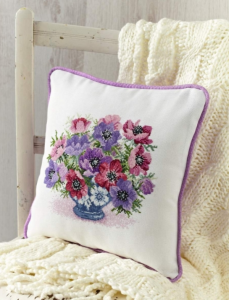 There are lots of lovely small designs, as the following shows, with simple pretty motifs that are perfect for the country kitchen. 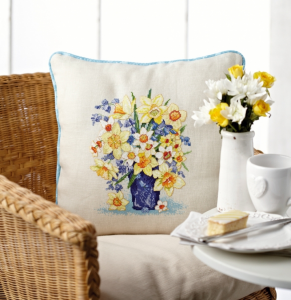 With these charts you can add some country cottage charm to your home with projects inspired by nature. I'm having problems with this one! 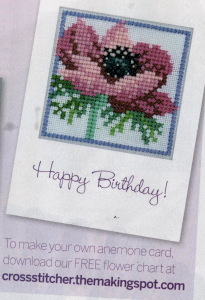 There should be a free download of an anemone flower - a small motif suitable for a quick card gift - with the large design of the elegant anemones. 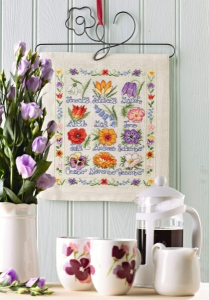 This flower sampler, in the latest edition of Cross Stitch Collection, will be a lovely, colourful picture to stitch and admire as a framed piece. The design however, can also have a dual purpose as each flower with its month will make ideal motifs for greetings cards throughout the year. Cross stitch: a red, green, yellow, black, brown and white......choose from the selection of stranded cottons you have. Backstitch: a black or dark grey - or a dark brown will be fine. I hope you like the latest free chart..........just in time! I'm having trouble getting the chart large enough but here goes so I hope it will work. 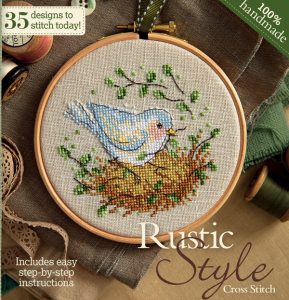 An update for you as Cross Stitcher magazine is now in the shops. 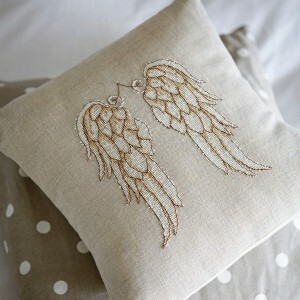 My design of the angel's wings makes a pretty cushion and I think not just for Christmas as I know it will look lovely in my bedroom with the creams and taupe decor that I have. However, the design of two Scottie dogs in this issue by Felicity Hall is an absolute delight .............it's hush, hush though, as Webs might get a bit jealous. Latest design to hit the shops! 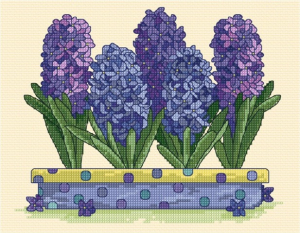 The hyacinths in this month's Cross Stitch Collection will just about give us a glimpse into Spring..........on a dreary day like today oh! how I wish. No free charts with this one, but keep watching and next month..........the delightful anemone will be on show with a lovely small free chart to download. Another view of the hyacinths as this may be a little clearer to see. Will be touch soon with more updates. A very busy month so far as I think everyone is leading up to that festive holiday!! 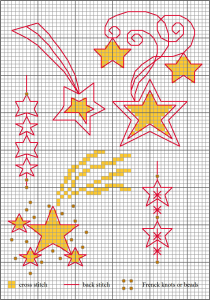 The backstitches are in red as I hope this will make them clearer for you when stitching. Please choose any colours for the motifs - metallic threads and gold beads would look lovely. Use them for quick cards, invitations to your Christmas parties or glue the stitched designs to white card tags as simple ties for your presents.